TCA (trichloroacetic acid) deep peel is a treatment used to remove layers of skin that show signs of aging or of damage caused by organic or external factors and to create the necessary conditions for new epidermis and connective tissue to develop. Q. What is a TCA Deep Peel ? Trichloroacetic acid is the preferred agent for chemical peels due to its stability and the fact that it is not toxic to the organism. This last property is especially important for treating older patients. Its uses have been studied thoroughly for decades and it has proved to have a great versatility. That is why it is not only used for deep peelings, but also for superficial or mid peelings. It can even be used in combination with other acids or with mechanic procedures such as dermabrasion. In order to achieve a deep peel the dermatologist will use a concentration of 50%, although for more superficial treatments a lower concentration may be used, the lowest been 15%. 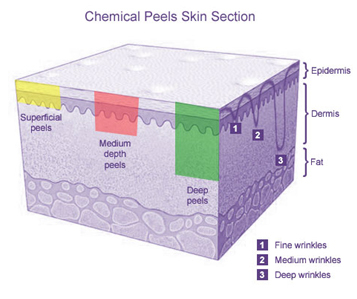 We may say that deep peel consists in a controlled aggression to the skin in order to bring about its regeneration. It triggers the coagulation of cutaneous proteins and the consequent destruction of the epidermic and/or dermic layer, which will be replaced by new epidermis and connective tissue. Q. What does TCA deep peel do ? It rejuvenates the skin by reducing signs of aging such as wrinkles and actinic keratosis (marks and thick spots in the skin associated with aging). It smoothens the wrinkles that appear due to repeated muscle contraction, such as the ones around the mouth and eyes. It evens out the skin's surface that is dry and cracked as a result of too much exposure to the sun. You may be required to pre-treat with Retin-A, pigment suppression or AHA creams usually starting one month before your TCA peel procedure. You should wear loose, comfortable clothing when coming to the office the day of your procedure. You should also arrange to clear your schedule for about 5-7 days after your peel. A medication may be prescribed if you are prone to having cold sores or herpes infection. The TCA peel is performed in our private procedure room at . In some cases, an oral medication is prescribed to reduce discomfort. The skin is cleansed and prepped to receive the TCA, which is applied to one section of the face at a time. The skin will feel hot for several minutes, but a fan may be used to reduce the hot feeling. The skin slowly begins to turn white or frost. The visible frost is an indication of the level of treatment the peel will achieve. When all sections of the face are treated, ice compresses are usually used to cool the skin. An ointment is then applied to the treated area. Q. What does deep peel consist of ? You will receive the treatment lying on the examining table of a dermatologic clinic. The first step will be to clean your face in order to eliminate surface oil. Then, the dermatologist will apply the trichloroacetic acid on your face. One of the greatest advantages of this acid is that it does not need to be neutralized, it is naturally neutralized after 3 minutes approximately. After this time has elapsed, during which it is usual to feel a strong burning, your skin will receive a refreshing rinse. The dermatologist will apply a moisturizing mask that will help relieve he swelling and inflammation and you will have to wear it when you go back to the hotel. Q. How long does the treatment take and how many sessions will I require ? Typically the skin is first thoroughly cleansed and then the practitioner will carefully apply the TCA solution. A full face of TCA peel usually takes no more than 15 minutes. Depending on which chemical peel is recommended for you it may vary from a one-off peel to a course of 4 peels with one each week. Sometimes two or more courses of TCA peels may be needed to obtain the desired result and may be spaced out over several months. Patients can expect the treated area to be red like a sunburn and have some swelling. Your surgeon may advise you to keep your head elevated and relaxed for a couple of days after your peel procedure. You can expect the outer layer of skin to shed for about three days, and the complete healing process to take 10-14 days. You can begin light exercise in 2-3 days, but you should avoid strenuous activity. You will be given special instructions on proper cleansing and moisturizing of your skin during this healing period. Avoid direct sun exposure for several weeks up to three months following a TCA peel, depending on the advice of your surgeon. Sunscreen should be used as part of your daily routine. Anaesthesia is not required for TCA Peels and you may feel slight stinging sensation as the peel solution is applied to the skin, but the feeling will quickly pass. Q. Are there any possible side effects ? All products have a potential for allergic reactions. It is important that the patient informs the practitioner of any allergies they may have. Transient reactions may include redness to the skin, itchiness, dryness and in some cases swelling. It is common for most patients to experience transient hyper-pigmentation. This will settle during the course of treatments and with use of the appropriate treatment creams and sun protection (SPF30). Although very rare, there may be in some cases risk of blistering.